If you have been at the intersection of 43 and 261 in Kent there is no way you haven’t noticed Mike’s place. There are some dead giveaways, the parapet, the catapult, the X-wing fighter. Yeah, that’s Mike’s Place. The place is akin to a trip down the rabbit hole. 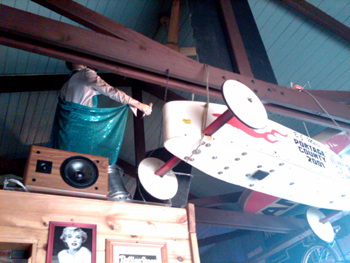 It had been a long while since I had been there and we stopped for lunch on a Sunday. One thing this place has in spades is amusement. The menus are a scream, the placemats are worth a read, and if your food hasn’t arrived yet just look around, and say hi to the Mad Hatter or Elvis. The service is very informal but was efficient, even with the place packed. It appeared everyone around us was eating breakfast from the extensive menu. Breakfast is served all day because as the menu says “cuz we don’t know when your lazy butts get out of bed.” Turns out we should have tried the breakfast. Instead, we tried the homemade chips and a short order of the wings. The chips were by far the best thing we had throughout lunch. The taters are sliced thicker and are fried to a nice dark brown. They arrived at the table still toasty warm with about a pint of ranch dressing. 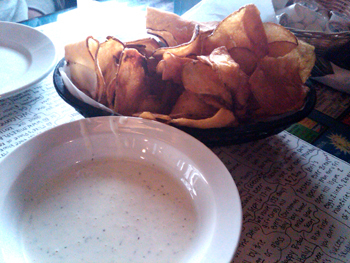 The chips really didn’t need the ranch but could have used a dose of salt when they came out of the oil. We tried the interesting sounding Buffalo Blue Cheezers sauce on the wings and the sauce was good but too subtle for a wing. 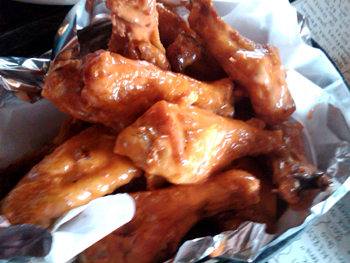 The wings also could have used about another minute in the dunk tank to give them that touch of taste and texture you get from a hint of crispy. We also ordered a couple of sandwiches. 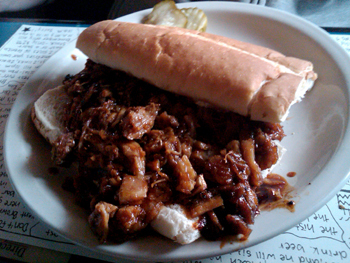 Steph had the “award winning” BBQ sandwich. I think the award must have been for the “Nothing But Ordinary” BBQ contest. It’s not bad, there is such a thing as horrible Q, Mike’s isn’t but it’s no different than any McTaco Hut’s attempt at BBQ. I ordered something off of the “Sumo” section of the sandwich menu. 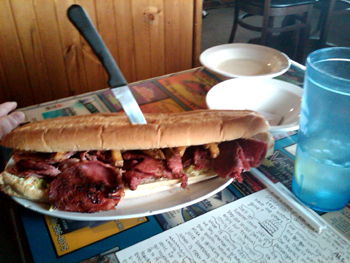 I couldn’t finish the Old Okie which consists of Grilled Corned Beef, Bacon, 1000 island & Coleslaw then is topped with fries. First it is huge and there is no way I was going to finish it. Secondly, I wasn’t compelled to finish it. The best descriptor I can muster for the Old Okie is sloppy. Sloppy in it’s conception, sloppy in it’s flavor profile, and tragically sloppy on the plate. Remarkably dry, hard chewy beef, floppy flaccid fatty bacon, eight fries, and coleslaw so sweet and intense it might as well be a slaw sandwich. We put most of both sandwiches in a box and ended up throwing them away at our next destination…beats taking up room in the trash at home which was their inevitable destination. Disappointing, there were so many other things on the menu that sounded so good, and given this trip I am much less likely to try them. 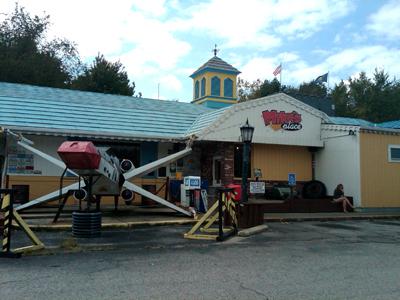 The place is fun and worth a trip, I just wish the food was. More focus on the product rather than expanding the menu would help Mike’s significantly. Until then, Elvis has left the building, at least after traditional breakfast hours.